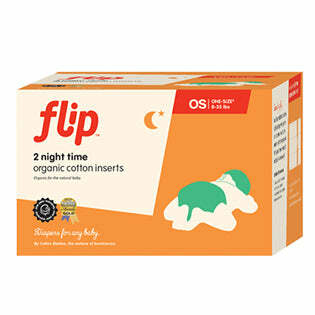 Flip Organic Night Time Insert 2-pack. Knit organic cotton prefold diapers made for trifolding in cover. Made in USA. Flip™ Organic Night Time Inserts. It's called "insert" but that really means "diaper", or absorbent part that goes in a diaper cover. Designed for the Flip diaper cover. 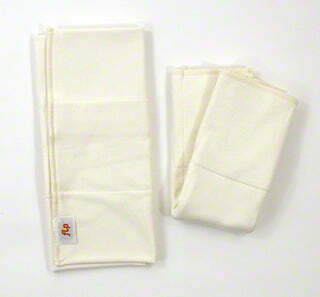 I like these because they are organically grown cotton and are knit which gives them a soft, squishy feel. The cotton is dense, soft and absorbent. It's about 15.5 inches long by 13.25 inches wide so it's fairly comparable to a medium red edge prefold. It's 4 layers all throughout (no thick center panel) so you can fold it either way more easily than a prefold. It's a little trimmer (flatter) than a prefold. So it's like a small yellow edge when folded the short way, and like a medium red edge when folded the long way. 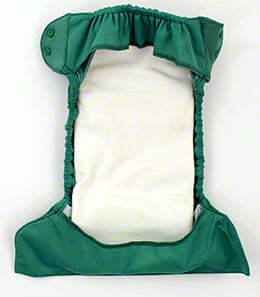 These "inserts" (aka diapers) also work in other diaper covers. Oeko-Tex® certified organic 100% cotton. It's a lovely, soft fabric. Made in USA. Did I mention these are soft? These are sold in 2-packs. They are not available individually. Flip Night Time Insert folded the short way in a Flip cover at the smallest rise setting. Diaper Cover sold separately here. All Bum Genius and Flip products can ship to USA addresses only. These hold true the description. Very absorbant! They're my go-to for night-stuffing a cover on my 13-month-old. I use with a flat folded around it and a Thirsties cover. Never had a leak!! As cloth newbies, we only knew we wanted natural organic fabric. As cloth newbies, we only knew we wanted natural organic fabric. We bought 6 flip covers and 36 organic night time flip prefolds- somehow I missed the idea that these were intended just to be night inserts! We used them daily for our go-tos. Yes, in the beginning these were very bulky on our small 2 month old (over those baby outfits?! we generally sized up 3-6 months on pants and footies). I loved the feel of this high quality cotton, and they held up pretty well over two years, now used on our second baby. Note: These inserts are definitely less bulky going into year three of use, but still extremely effective and our go-to for day and night use (in addition to GMD organic workhorses). Highly recommend these for all babies for night time, and on larger babies, they are great for day use. I avoided these thinking they were just a spendy pre-fold. I avoided these thinking they were just a spendy pre-fold. WRONG! 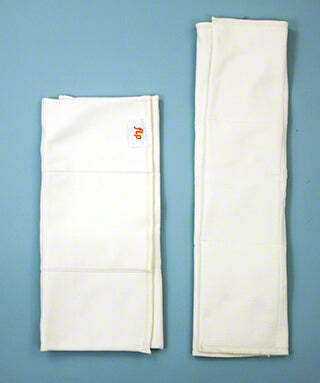 These are super absorbent, they stay flat, not super thick - trimmer than most fitted and stay in place. I do not know durability but guessing they will not last as long as pre-folds due to having similar fabric in the AIO that got surface wear so I would not use these daily for multiple kids and expect the same performance as GMD pre-folds. They also hold stains more so I put inserts over them. So why 5 stars? These are my outing and road trip diapers and are WAY better than pockets and most AIO on the market (I have tried many with 6 kids). Couple these with Flip stay dry or a NB Flip stay dry (owned them already so putting them to use) in wrap covers - Flip, Bummis, Imse Vimes etc. Baby is more comfortable if wet and we can not stop yet (driving across country) and this combo hold a ton! Easy to use and wash on the road. I used many covers pre-stuffing for same ease as an AIO so if poo happed I put the whole thing into wash bag and reuse others. I have 15 for a 3+ week trip coupled with some hemp prefolds and stay dry hemp doublers.